A recently discovered planet has a mass twice as great as Earth's and a radius twice as large as Earth's. What will be the approximate size of its gravitational field? This is College Physics Answers with Shaun Dychko. 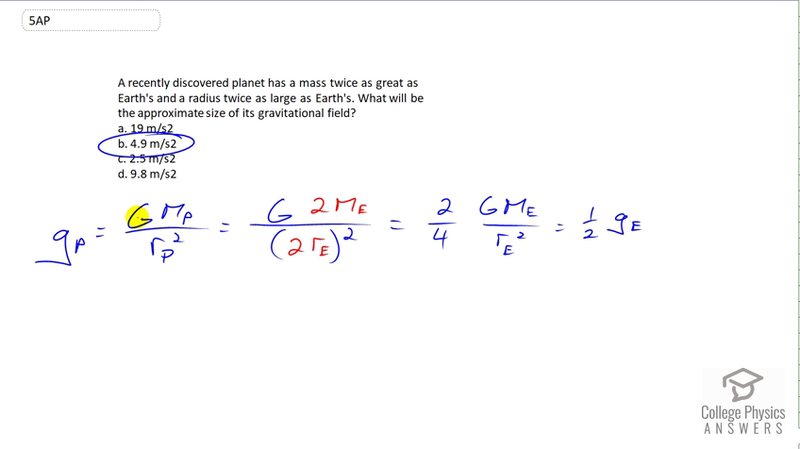 The acceleration due to gravity on the surface of this newly discovered planet is going to be the universal gravitational constant, capital G, multiplied by the mass of the planet divided by the radius of the planet squared. We’re told that the mass of the planet is two times the mass of the Earth, so we make that substitution for MP, 2 ME, two times mass of the Earth. And then in place of rP, radius of planet, we’re going to substitute two times radius of the Earth because we’re told that the radius of the new planet is twice as large as Earth. And so when we square this, we get four in the denominator, so we have two in the numerator and four in the denominator and we have G ME over rE squared, but this is the acceleration due to gravity on the surface of the Earth. Two over four reduces to one half, and so we have one half times the g on the Earth. So one half times 9.8 is 4.9, so the answer is b.